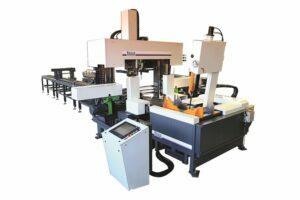 Selmach Machinery and the UK Machinery Group are the exclusive stockists for the new Bauer Sawing-Drilling System. 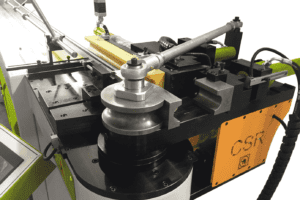 Designed to be compact and able to fit into tightly spaced workshops, the Bauer Sawing-Drilling system is a cost effective machine, competitively priced for the smaller steel fabrication companies. This system is set to be a real competitor in the structural steel processing market. 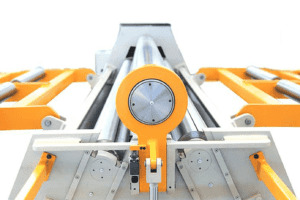 Drilling into structural beams, hollow sections, profiles and flat materials in the past could only be done by using magnetic drilling machines or large expensive sawing-drilling lines. 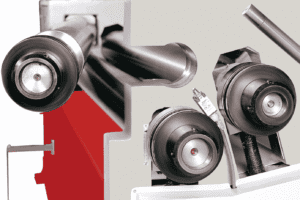 Magnetic drilling machines are operator-dependent, time consuming and requires manual measuring and marking making the operation susceptible to human error. Large saw-drill lines are expensive and are only available in large cutting capacities taking up huge floor coverage. Therefore Bauer have developed a new generation of sawing-drilling systems which are viable for small series and are also easy to use. With little CNC knowledge necessary and as a compact space saving size the Bauer Sawing-Drilling Machine opens up completely new possibilities. With more than 10 years on the market the Bauer sawing machine has a legacy of success. This is German engineering at its very finest. The robust and torsion-free steel offers a high quality, high accuracy, fast amortisation, 3 side drilling machine at affordable prices. Selmach Machinery can offer the Bauer Sawing-Drilling machine at affordable rates looking after the smaller local companies.